Share with my existing 15 gal. tank. At first was designed to keep high grade shrimps and later found not successful with them. After that, used it to keep corydoras fishes and golden algae eater, and now shifted all the fishes out to another tank, add in new lapis sand on top of the old gravel and hope to get some nice fishes from LFS. But I post pictures of the tank here to see what idea of fishes you can suggest for me. LOL. Tank size 24" x 12" x 12" H. Thanks in advance. Here are my two 10 gallon tanks, the one with the sand substrate has a Bosamani rainbow, four Kuhli loaches, two hillstream loaches, and an albino rainbow shark, as well as a few malaysian livebearing snails. The plant in this tank are an Amazon sword (left rear corner), Balansae (right front corner), wysteria (right rear corner), and a start of hornwor center back. 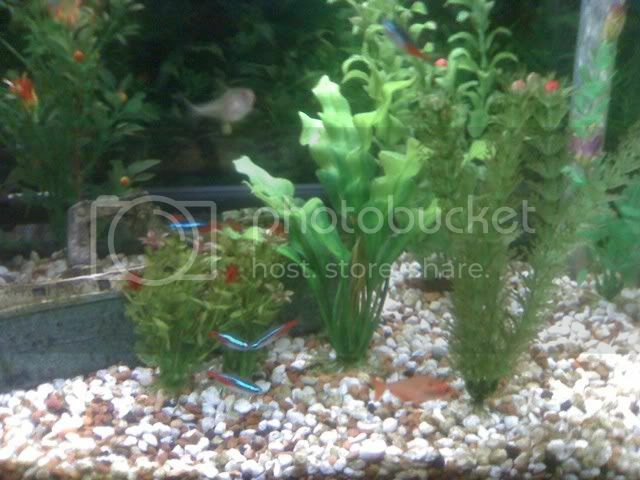 the tank with the blue gravel houses a pair of mystic blue swordtails and three Kuhli loaches. The plants in this tank are wisteria on the left side and anubias in the right front corner. The 20 gallon tank (with the Roman styled column in the middle) is currently cycling, and will have some plants in it on the 15th. I plan to use this for guppies (my wife wants these) and cherry red shrimp. For plants I will put some java moss or the like, wisteria (one start in the tank now right hand side), Swords of somesort (maybe a different variety than the Amazon sword), and maybe some grasses. The only critter in this tank now is a single malaysian snail. Last edited by D.Gray : at . 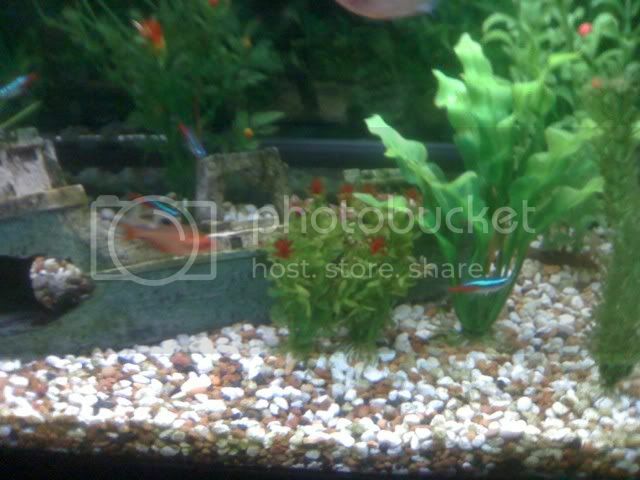 16-gal bowfront - there are 3 fry visible here with my two platies. (Number 4 is hiding...) This is after I made an attempt to clean the algae yesterday - my decor and plant leaves were almost completely black! 14-gal rectangular - new home for my molly with attitude. I figured I would post a few pics. I will post more later. All comments welcome. what do you think of mine? one is a 25, eclips hood, the other is a 55. 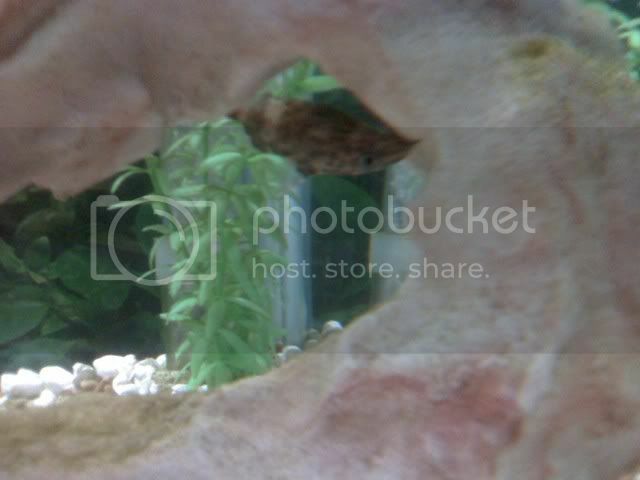 Did you buy the Gourami for the Bichir to eat? Kind of expensive food, huh? Very nice picture, now they are odd tank mates. Look nice, though. Thanks for sharing the pictures!! Please resize your pictures to 500 or less pixtels wide! lol, no i had the gourami first.he is actually the more aggressive of my fish for some reason.but for the most part they get along well. when i saw the bichirs i couldn't resist buying them.thank you.